Chris Davis is an automatic play so long as the DFS industry insists on trolling him with below minimum pricing like this. In fact, the only question we should ever have when it comes to Chris Davis at this price is not whether we should play him but rather if the titans of DFS are indeed working together behind the scenes. I don’t think this warrants an investigation, but it is interesting that every major DFS provider all lowered his salary to historically unprecedented prices and all on the same day. I haven’t seen any press releases nor any statements on this. Nor has there been any coverage or discussion of the industry wide decision to lower his price below what was previously assumed to be a minimum price. Yes, it does coincide with him breaking the hitless streak record, but the unity in which this action was taken is a little too much of a coincidence as far I am concerned. There are also enough discrepancies in pricing between the sites that they aren’t working off the same algorithm, nor would an algorithm suddenly decide to become a troll and create new min pricing rules. Nor would he be the first to fall to these prices given the slew of people who never play. This was clearly a man-made decision that was unprecedented, and yet everyone did it all at once. It causes my imagination to stir of backroom dealings done through a wisp of cigar smoke at a conference table surrounded by shelves of leather-bound books. But more likely it’s probably some backwards hat wearing bros communicating on Snapchat while waiting in line at Jamba Juice. But I digress, let’s take off our tin foil hats and talk data. Lock in “Crush” below minimum salary for a chance to win some money playing Yahoo MLB DFS. In fact, if you played him yesterday you got great value as he walked and scored a run. Chris Davis has five walks, one run and two RBI thus far on the season. Granted, this was done over 8 starts, but the point is he is contributing at times in small doses. We can be assured his ceiling is north of zero. If you had unlimited roster spaces and could play the same player more than once, an all Chris Davis build would be rather competitive most nights. Simply getting a walk would win the GPP. This shouldn’t need any explanation. But to point out the obvious, even if his strikeout rate were to remain at 45%, we can’t possibly expect him to maintain a BABIP of zero. The most pessimistic rest of season projection for Davis is ZiPS with .266. 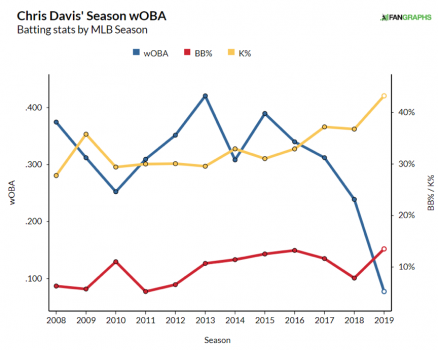 Davis is a career .303 BABIP hitter. 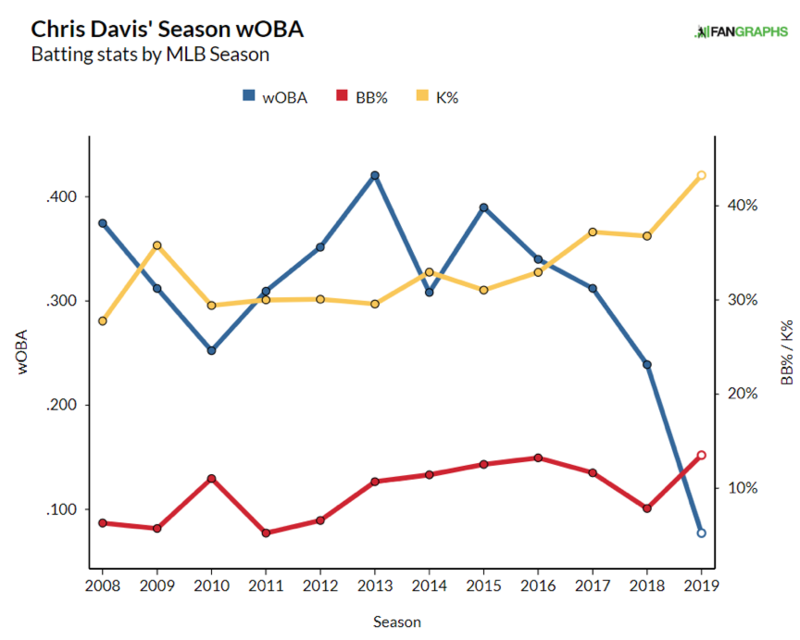 Career numbers with Davis are a little deceptive though because he’s not consistent in the slightest. His career can be easily viewed as one of valleys and peaks. If you’re unfamiliar with wOBA, it’s very highly correlated with DFS value and anything above .400 is elite and anything below .290 is horrendous. 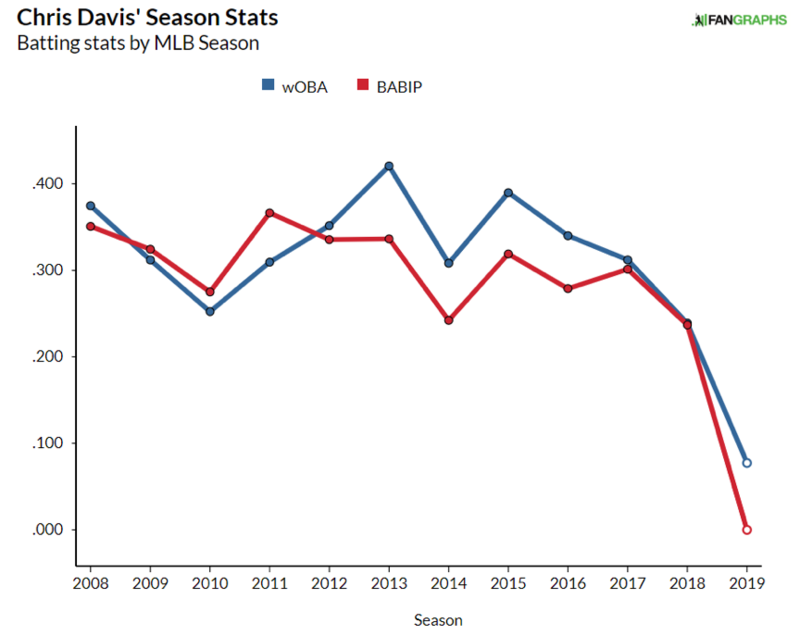 Davis has somehow managed to do both and even sandwiched the amazing season with the horrible ones. He is the epitome of inconsistency. Although it creates these dramatic declines, let’s just throw out 2019 as he hasn’t even had 50 plate appearances yet. We’ll circle round to that later. Acknowledging that he’s inconsistent and been very bad then very good before, we’ll still dive deep into this. 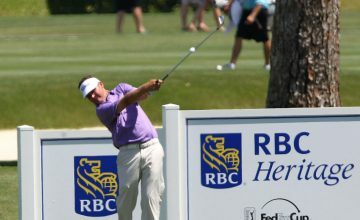 First, we will look to see if there have been any dramatic changes in his hitting profile. His walk rate fell a bit last year and that’s concerning but it’s not unreasonably bad. His K% is also up the last few years. While this is bad, it’s not a huge cause for alarm. He had very high K rates and low walk rates in good years as well. In fact, if you look at the league leaders in K% each year, it’s usually a list of MVP candidates. 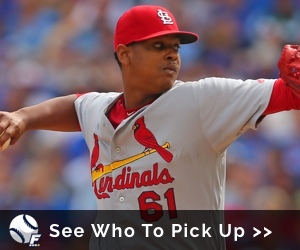 But we’re not talking about whether or not we should bet on him winning the MVP this year, we’re talking about whether he should be played at an unprecedentedly low price. Creating outs is the problem, it doesn’t matter so much what form they come in. Let’s investigate some more into just how exactly he’s creating outs. This right here says when he does hit the ball it still makes an out. So he’s striking out more, which means less chances to get a hit. Furthermore, when he does make contact the results are getting increasingly worse. Seeing his BABIP next to his wOBA, it looks like it is pretty highly correlated and would seem that the fact that the balls he puts into play end up as outs more frequently would better explain his drop more than an increase or decrease in walks and strikeouts. 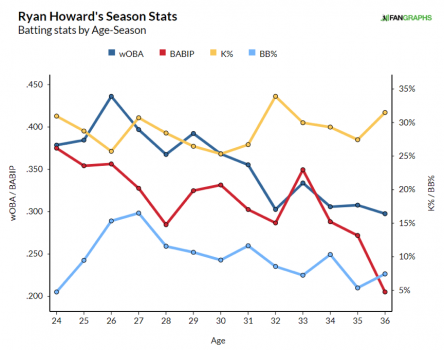 Chris Davis has often been compared to Ryan Howard, so let’s take a look and compare the two. Here I included age instead of year. 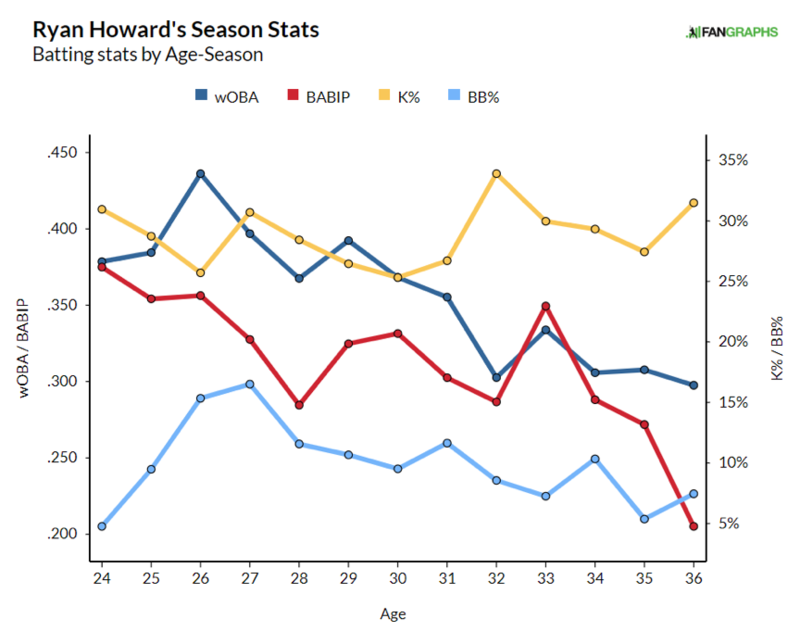 You can see that Ryan Howard also increased his K% while lowering his BB% and BABIP at the same time (32 years old) and this had a disastrous effect. Although this is likely just statistical noise, he did rebound as a 33-year-old before continuing down his spiral. Chris Davis is 33 this year for those who love narratives. I should disclose something though, there’s nothing revolutionary about this information at all. Nearly every player has BABIP and wOBA correlation like this. I just like telling a good story and couldn’t find a good way to segue into Ryan Howard and shifts. It’s always good to look at the numbers yourself for a second opinion. A lot of the data out there used in DFS articles is misinterpreted by the author or outright wrong but it feels compelling so people who really have no business writing advice articles use it to tell a story. See how I just segued into shifts without even needing to lie about data? I’m becoming a better blogger by the minute. Ryan Howard’s K% increased and BB% decreased, but as you saw, the real culprit to end his career in ignominy was historically awful BABIP. Of all the hitters in baseball, you could probably argue that Ryan Howard has suffered more due to the shift than anyone else in baseball. If he played in another era without the shift, his legacy would be significantly different. At 39 years old, it’s possible he’d still be in the league as well. 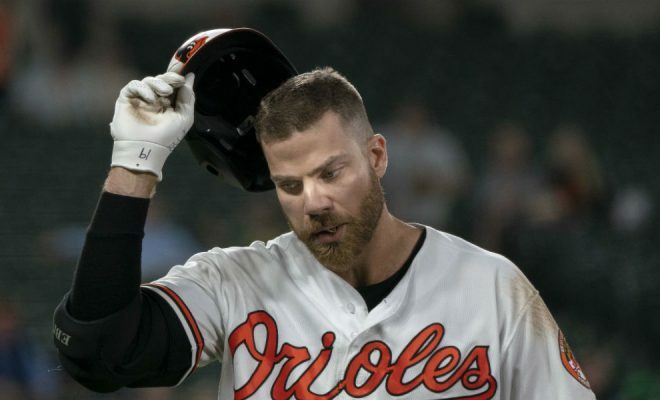 For Chris Davis, he has 608 plate appearances hitting without a shift and has a .354 BABIP and .349 wOBA in those situations. Just like Howard, he too suffers greatly by specialized defensive alignments. In 1,642 plate appearances, he has a .277 BABIP and .272 wOBA. Well as you can clearly see here, the human eye is horrible at data analytics. So rather than going down “JD is turning 32” alley, let’s look at some numbers instead of pretty pictures. 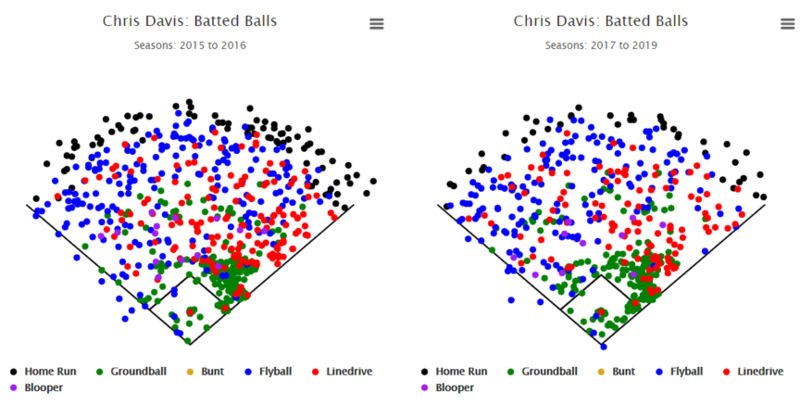 Davis’s batted ball profile (LD/GB/FB) went from 25/32/44 in 2015 to 20/37/44 in 2016. 2015 was his second best year and although his batting average dropped dramatically in 2016 (he traded in some liners for grounders) he still had a good season with 38 HR to support a robust 2.9 WAR. In 2017 the batting average stayed the same but his power is what dropped. The slash line dropped to 24/36/40 and followed up by an even worse 21/40/40 (I rounded, deal with it). 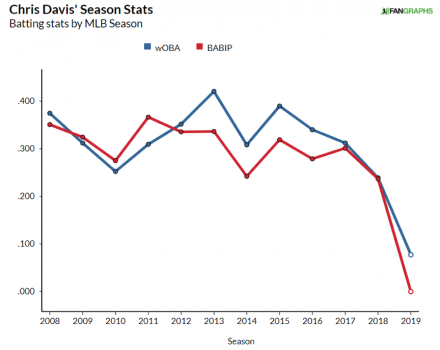 This explains significantly why Davis’ BABIP has suddenly plummeted. When you hit more ground balls you hit into the shift more often. Furthermore, when you hit fewer fly balls, you’ll also hit fewer home runs. It’s not exactly rocket science. Now we can look at that spray chart again and it will begin to tell a story. But don’t kid yourself, it’s still a bucket of jelly beans to count, just this time you know the correct number to guess. Don’t ever let pretty visuals prevent you from looking at something visceral. So then, we’re looking at a pretty sharp drop in line drives coupled with a decrease in fly balls. But let’s see what he does when he manages to put the ball in the air. He has a career HR/FB% of 23%. That’s pretty impressive. The league average is like 10% and a power hitter typically is between 15-20%. You can’t chalk it up to luck either, this number doesn’t fluctuate very heavily for him. Since joining the Orioles, his HR/FB% has never been below 23% until last year. Last year at 15% he only showed good power and not otherworldly like the previous year at 25%. You could just as easily argue it was an off year rather than the beginning of a downward spiral. Do I need to remind you JD is turning 32 again? 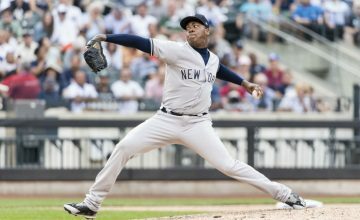 I’m looking right now at projections from THE BAT, ATC, Depth Charts, Steamer and Zips. Unsurprisingly, they are all more or less the same with almost no variation. None of them seem to think Chris Davis is going to be a good hitter anymore. But they certainly don’t believe his HR/FB drop of last year was real. Combining the most pessimistic of the projections gives him credit for 21 home runs and .196 batting average. Now nobody is going to say that’s good. But it implies they all believe he’s going to rebound off his 16 HR .168 batting average season (and by significant margins). Furthermore, when you look at their rest of season projections, they’ve only moderately adjusted things. His rest of season batting average still hovers in the same ballpark but more tellingly, he still has the same amount of HRs projected. They may not believe he will get as many base hits from his early season struggles, but they still believe when the man makes contact, it’s likely going out of the park. On Yahoo, Chris Davis is only $1 compared to previously assumed $7 minimum. On FanDuel, he’s $500, DraftKings is $2000 and FantasyDraft is $3900. While his price is only half that of the next cheapest option on some sites, he’s a 1/7 the cost of the next most expensive on Yahoo and a 1/4 that on FanDuel. Yet even the best hitters in baseball aren’t expected to outperform him by anywhere close to those margins – never mind the min priced guys we’re comparing him to. For rest of season projections, there’s only one single player projected to have 2x more HR than Chris Davis the rest of the season and that is Giancarlo Stanton. Now, this is really lazy and I know there’s a lot of points that don’t come from HR. But you get the idea. Giancarlo Stanton is also unlikely to cost the actual minimum price for that matter as well. 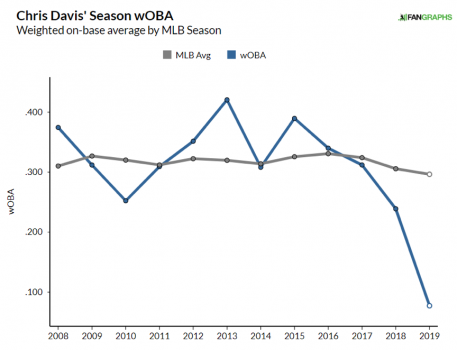 You can even argue that Chris Davis doesn’t even need to do anything to still hit value because you can pass on the savings for significantly better players elsewhere. Then, when you consider he has the same floor as Mike Trout and a higher floor than any pitcher, it really becomes a no brainer. Even if he were a singles hitter without the HR upside, I still think at these prices you can’t not play him. 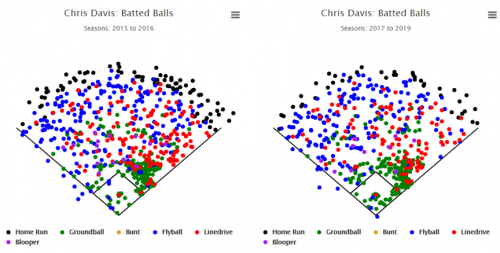 For many, Chris Davis is still unplayable despite the pricing. In my last Yahoo competition, he was only around 15% owned. They saw the writing on the wall last year and this pricing is confirmation he’s officially over. However, I think we may be jumping the gun a little here. 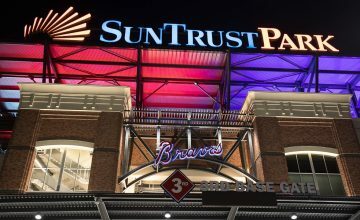 It takes over 800 situations where the hitter puts the ball into play to determine if a BABIP is real or not. That’s more than 2 seasons for most hitters. It takes 600 of those situations to determine line drive rate. In fact, the only things you can tell with any remote reliability in less than 100 plate appearances in K% and we already knew he’s always been horrible at that. What matters for Chris is a very difficult thing to gauge with any accuracy. While all signs indicate he is on the decline, we can’t mathematically prove that until it’s too late for DFS purposes. The takeaway here is that if you’re looking for an answer based off advanced statistics for baseball DFS then you’ll need a DeLorean, a flux capacitor and a penchant for confusing titles that have a snazzy ring to it. I also think anyone who had those things and chose to put it to winning in DFS doesn’t aim very high in life for that matter. I’m not trying to prove Chris Davis hasn’t lost it. This is by no means an argument that he’s bad or has been unlucky. The point, and frankly it’s a big one, is that there’s enough uncertainty here that this could be an incredible and can’t miss value. This is especially true on Yahoo and FanDuel. Even if he is forever gone, the roster flexibility his current pricing offers is too good to pass up. He’s also still going to occasionally get a walk or a sacrifice fly and that’s just gravy. And don’t forget that he was intentionally walked already once this season. If opposing managers are respecting him enough to do that, then you need to swoop in on this pricing. I merely posit that there’s still a chance his recent struggles were a fluke. But this doesn’t even matter, at his pricing, he’s so cheap that he’s still a great play even if he only contributes the occasional rogue walk or sacrifice fly.